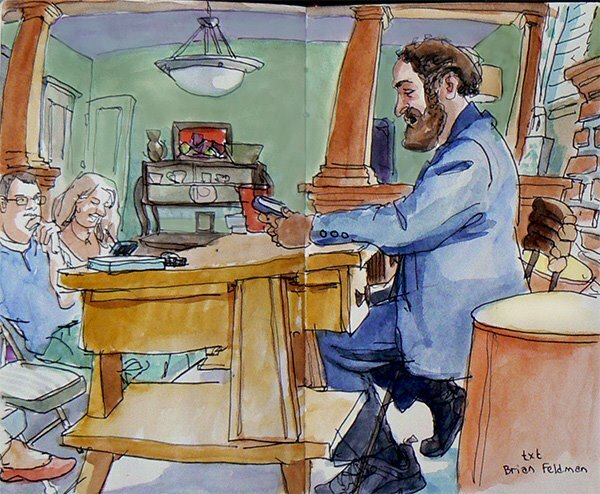 txt was a performance by Brian Feldman at the Jack Kerouac house in College Park. The premise of the performance piece was that the audience would text the script to Brian as he performed by reading his iPhone. A small stage was set up in front of the fireplace in the living room and 2 lamps were placed on either side of the stage as foot lights. The performance felt more like a digital seance rather than a simple reading. All thumbs and index fingers were busy typing as Brian started to read a strange disjointed mix of ideas. His reading was peppered with sexually explicit language that even comedian George Carlin might be embarrassed by. I began to think I was in the room with a mix of lunatics rather than a quaintly bohemian audience. That guy in the back row looked like he was having way to much fun as he typed his entries. He must have been the one who typed over and over that fingers are people. At one point Brian glanced at a message and turned to look at a picture of Jack Kerouac on the wall behind him. He then recited, "That Jack Kerouac is a hunk, I'd do him". Had a woman in the audience really typed that? Could the guy giggling to himself in the back row have typed that? I found myself laughing uncontrollably at the absurdity of many of the texts being transmitted. 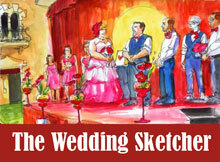 The young couple in the sketch had to share an iPhone. First she would text and then she would hand it off so he could text. My wife, Terry, said than none of her texts had been recited. That caused me to think afterward that perhaps like a seance not everything was as it seemed. Regardless I was certainly entertained. Post Script: A number of participants informed me that without a doubt all texts were strictly written by audience. Texting seems to unlock inhibitions, it offers a chance to write things that would never be said under normal circumstances. txt was a Mad Lib with an emphasis on Mad. 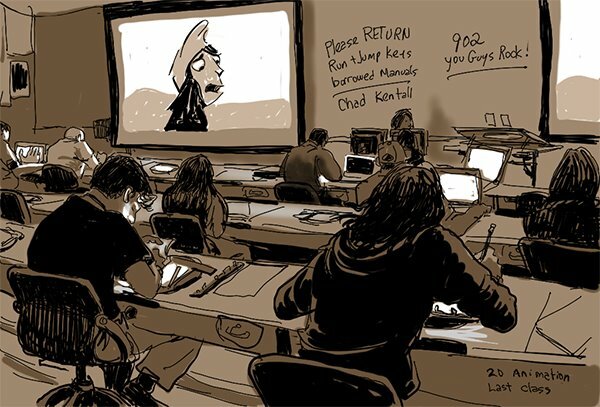 For the last class of the month in 2D Animation, the students get to choose a film to watch from a selection of about 10 animated feature films. This month they chose to see "The Emperors New Groove". I did some drawings in that film of the character Pacha and Kuzco. The Florida studios contribution to that film was just to assist the California studio on scenes that needed an army of extra hands to get the film finished. Some students watch the film intently while others are trying to finish the final drawings in one of there assignments which is a flip book. The students in this class did some really amazing work over the course of the month. 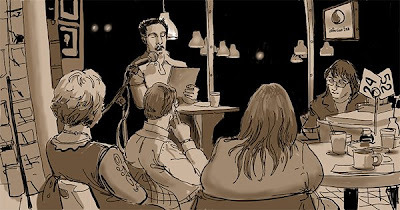 Infusion Tea on Edgewater Drive featured another reading by Kerouac House resident artist Michael Hawley. This was Michael's last evening in Orlando. The next day he would have to pack and fly a plane back to NYC. He said he felt a bit sad to leave but he was grateful for the time he had been given to write without interruption. The evening was hosted by Naomi Butterfield. Besides Michael 5 other authors recited poetry and excerpts from works in progress. 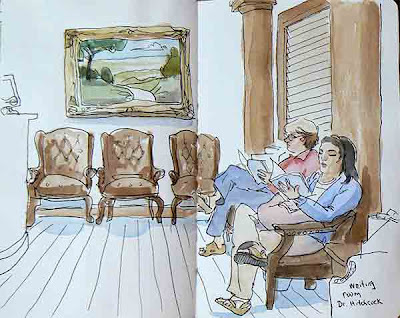 I was very impressed by the reading from the author who is seated to the far left in the sketch, her name is Stacy Barton. She read chapter 6 from her first novel which is about a young female art student who was essentially date raped. This young artist while sketching is approached by the child of a midwife who is so forward that she reaches out and places her hand on the artists belly and coos to the child inside. This haunting and tender image remains one that leaves me wanting to know more. I again find myself thrilled and inspired by all the talent in the room. David, the executive director of the Orlando Philharmonic Orchestra, hosted a Fat Tuesday party at his home. The Friends of the Philharmonic and members of the Board of Directors were in attendance. David decorated his home by perching glittery bowler hats in unexpected places and hanging beads from chandeliers and furniture. David barbecued a huge slab of brisket and guests each bought a side dish. 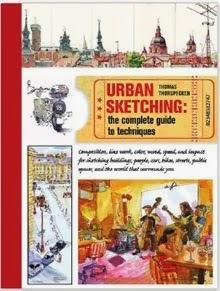 While doing the sketch I met a woman who worked as one of three graphic designers for Tupperware many years ago. Today she says Tupperware employs 35 graphic designers. 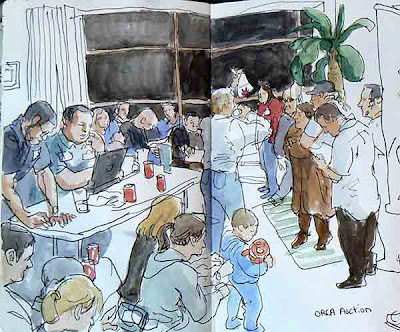 This is one good thing about sketching at a party, people interested in art will introduce themselves to you. The sketch was started after dinner. When I began the room was packed. However in Orlando guests do not tend to linger at a party, they want to rush home. 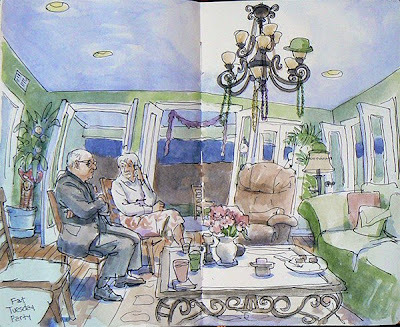 The fellow in the black pin striped suit was in costume as a gangster, his wife had a wonderful flapper outfit on but she never entered the room while I sketched. I started working freelance at Premise Entertainment studio in Orlando. The studio is located in a nondescript office complex. I signed a non-disclosure agreement and picked up my first scene for a feature animated film. Since the walls in almost every room were covered with backgrounds and character studies, I decided not to draw inside on my first day picking up work. I was lucky that they were screening some dailies and I got to see the work they had done the previous week. It was exciting to rejoin the 15 or so artists from the old Florida Disney Feature Animation studio days who are working in the facility full time. I was told that to find the building, I should look for the Utility truck parked out front. I could not pass up the opportunity to sketch the utility crew after I picked up the scene. I spoke with the crew since they became curious about what I was up to. They were doing routine maintenance on the electric lines underground. They discovered that one connector had blown out and was lying on the ground. They showed me the part that had blown. It was a heavy metal cylinder that had a chunk missing like it had exploded. Apparently they usually check the connectors by just touching them by hand to see how warm they are. Today for an unknown reason the worker decided not to do that. He is glad he did since that blown connector could have given him a 7200 volt jolt had he touched it. Our guests decided they wanted to once again go shopping, so we went to the Millenia Mall first for lunch and then shopping. We decided to go to the Cheesecake Factory but the place was packed. The wait would be 45 minutes, so I took the buzzer and we all split up to go shopping with the idea that I would call everyone when the buzzer when off. Terry took me to the Gap and I got 2 pairs of long pants, which I must admit I need since my jeans have developed a hole in the right knee. The buzzer went off and we all met at Cheesecake Factory. We were offered a table outside. Terry asked if there was smoking outside and was told we would be in the back so we would be away from any smoke. As we went over our menus, an older man at the table next to us, took out a cigar and lit up. Terry and Elayne noticed immediately. Elayne caught a waitresses attention by shouting out "Yoo Hoo Waitress!" What followed were fruitless arguments with waiters, waitresses and a manager about moving our group to another table or asking the man to put out the cigar. There is no law in Florida against smoking in a restaurant outdoor cafe area. We were told that we would go back on the waiting list, which we knew would mean another 45 minute wait. Terry let the manager know that in today's economy it would not pay to treat costumers like cattle. We argued among ourselves when the staff left. Should we just walk or put up with the inconvenience. We decided to stick it out and started reading the menus. Since the waiter was taking his time coming back, I decided to start a sketch of the guy with the cigar. I got 3 lines down when Terry stood up and said lets go. I was furious, because I never stop a sketch once it is started. 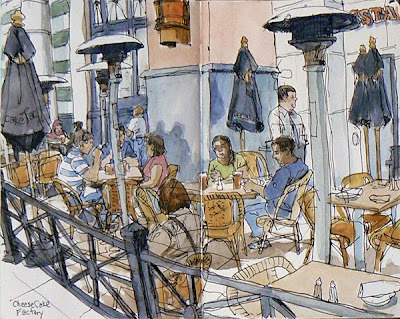 You can see the guys nose and glasses hidden among all the detail of this sketch, which I did after we had eaten at Brio Tuscan Grill across the way. Our waiter at Brio Tuscan was funny and charming. We were glad we had made the move. Bob, Elayne and Terry are relaxing on the porch of the Lakeside Inn in Mount Dora after a full day of shopping at the Renningers antique show and flea market. After sipping drinks they each had a turn to show and tell all about the great bargains they had found. Elayne's daughter Haley and her boyfriend, Ryan were also on hand but they decided to walk hand in hand down to the lakefront to watch the sunset. Elayne is checking her iPhone and is about to call her boyfriend Derick. She found a Mr. Oreo flexible figurine for about a dollar and a Wise Owl glass jar. Terry bought some collectible 1950s dishware and a stunning bejeweled evening bag. Bob always returns to Washington DC with collectible silverware he gets from the same dealer he has been going to for years. They all agread that this year offered unheard of bargans. 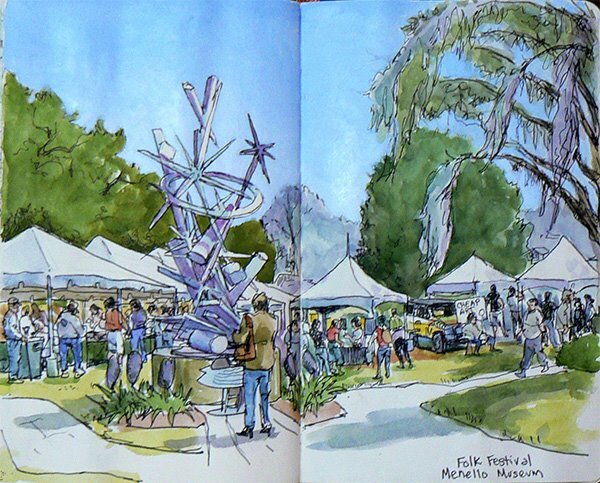 This weekend two friends of Terrys, Elayne and Bob, are staying over so they can go to an antique show - flea market called Renningers in Mount Dora, Florida. Bob and Elayne have been going to this event since, well since before they can remember. Bob flew in from Washington DC and Elayne drove up from Miami. Renningers is a huge event with hundreds of vendors and more stuff than you can shake a stick at. I am a bit disappointed that I can't go this year since I have to work at Full Sail this afternoon. 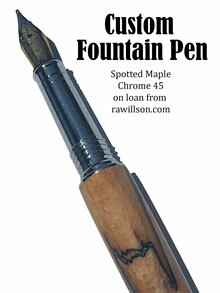 I had dreams of finding an antique fountain pen with a soft nib that would change the way I drew forever. Oh well, maybe next year. Once everyone arrived we went out for a quick bite of lunch and then drove straight to the Outlet Mall at the headwaters of International Drive. 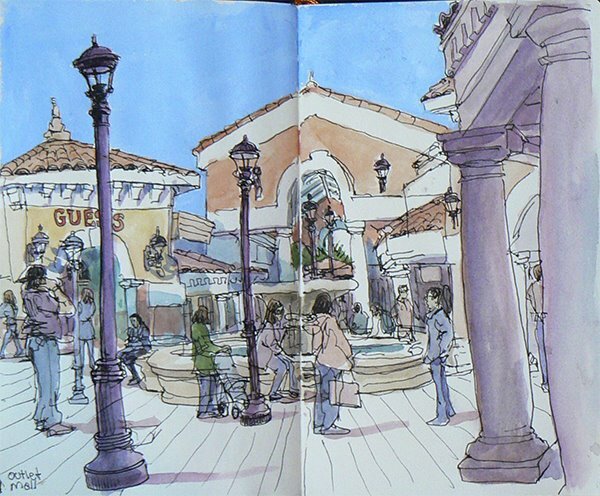 I avoid the malls like the plague, but decided to go this once to shop for a sketching location. Terry gave me an escape route by letting me drive her car home when I finished the sketch. 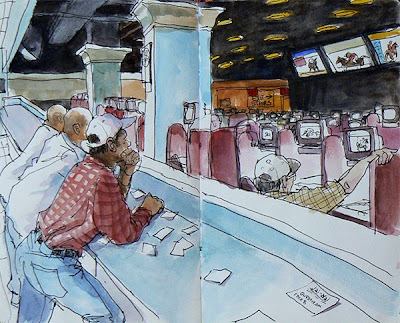 Inside the Jai-Alai building on the third floor is a 340 seat Las Vegas style race book to accommodate the fronton's loyal simulcast players. The simulcast facility feature 30 state of the art 65 inch big screen televisions and 340 individual workstations with 9 inch televisions. The racing schedule features simulcasts from the South Florida circuit of Gulfstream Park and Calder Race Course, the New York circuit plus race cards from Kentucky, Maryland and Southern California. Personally I was overwhelmed by all the information being broadcast all at once. I didn't know what screen to look at let alone what horse to bet on. 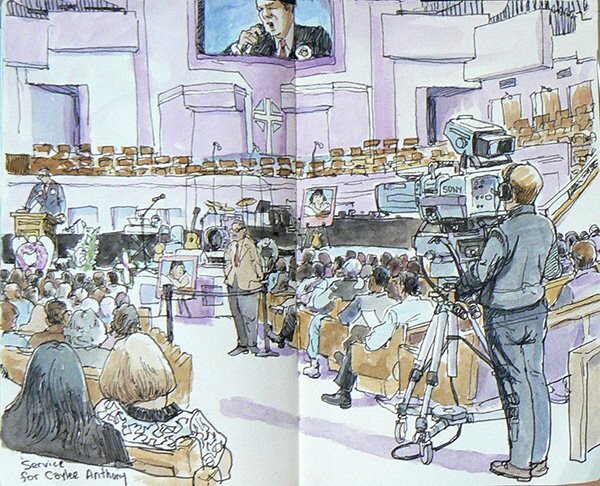 But for zero money down, I got to sketch a room full of very excited people. When a race starts the excitement in the room becomes palpable. The guy standing next to me started screaming "Come on baby, you can do it. Go! Go! That's it, yes! Go! Oh! No! No! Aw S%*t! I never get a break." I only asked one person if they were ahead, he said "Do you know any gambler that is ahead." 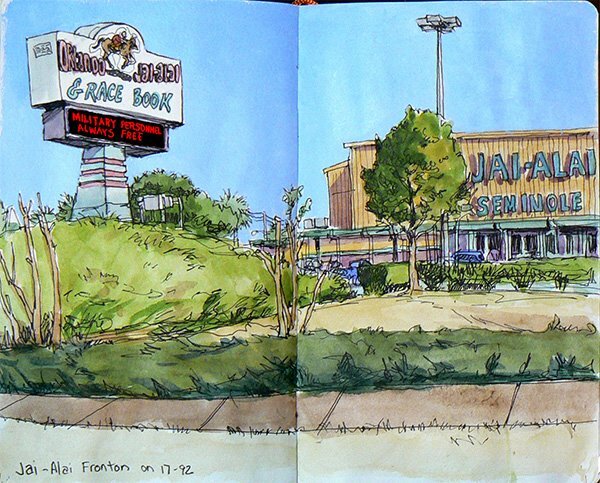 He then started to lecture me that I shouldn't waste my time sketching in the fronton. He also said "You need to follow the money, the money is in children's books, no one wants to see people betting on the races." A friend of mine of mine named Louis has just gotten back home after spending 17 days in the hospital. He has been diagnosed with cancer and had to undergo chemo treatments. Apparently this form of cancer is very treatable so he has a good chance to beat it. My wife asked me to do a sketch for him. I know he loves to bet on the horse races so I decided to go to Jai-Alai Fronton a state of the art horse race enthusiasts dream. The Fronton wasn't as crowded as it was the last time I was there with Louis, which was for the Kentucky Derby. There was a core group of die hard race fans however who looked like they live in the place. Admission is usually $1 but today it was free, thank god for the failing economy. I thought it important that the sign up front was flashing "Military Personnel Always Free". I started this sketch knowing I only had 20 minutes to work before this final act finished. I sketched with the hope that they might do an en chore but I had no such luck. The fellow in the wheel chair right in front of us was very enthusiastic. After each song he would shout out "You guys are great!" When The Ashley Gang lead singer told the audience that CD's were available afterwords, the guy in the wheel chair shouted out "I want 5!". The performer behind the mic then told the audience "You all can learn something from this fellow up front. He is our answer to a folk musicians bailout package". 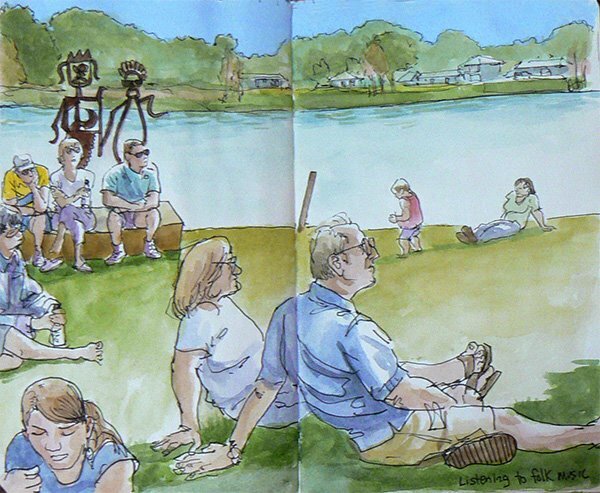 The audience relaxed on the grass on the banks of Lake Formosa to listen to the Musicians on stage at the Orlando Folk Festival. Terry and I had a hot dog for lunch and sank into our lawn chairs. Small children were playing and dancing to the music. Those odd rusty characters are metal sculptures. 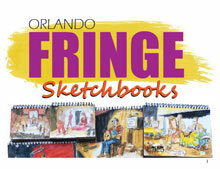 This presidents day weekend the Mennello Museum of American Folk Art hosted the 7th annual Orlando Folk Festival. Admission was free. 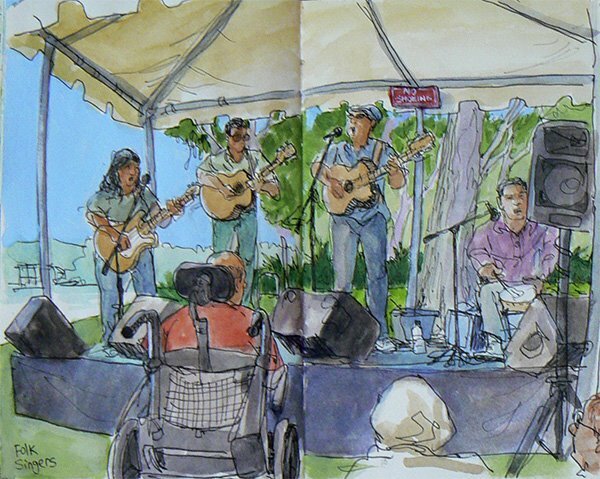 There was a stage with live music and a collection of tents with folk art and local crafts artists. 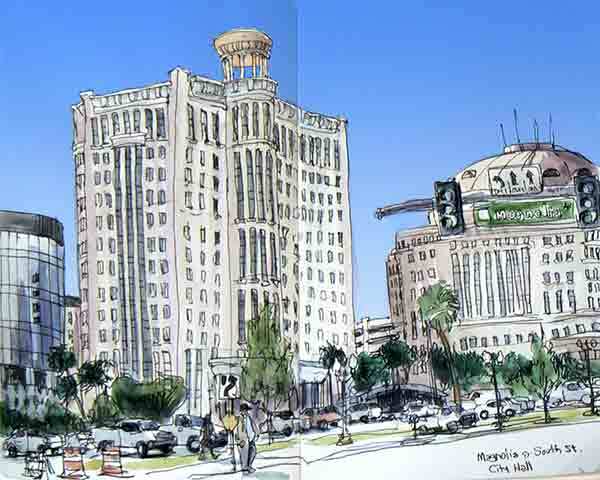 The tent just right of center in this sketch was set up for the Kerouac Project. When Terry and I walked up to say hello to Kim and Summer, who were manning the booth, a woman named Helen, was looking at a photo of a Jack Kerouac residence in Orlando on Yates Street. She thought she recognized the house and called her brother in law who she thought might live there. The brother in law confirmed the address over the phone. Jack Kerouacs mysterious influence seems to be working to this day bringing people together. While doing this sketch an artist approached me because he was curious about the Niji water brush I was using. I explained where he could get one without ever stopping work on the sketch. When he was leaving and saying goodbye, we glanced at each other for the first time. It turns out he is Brian who was my first supervisor when I started working at Disney over a dozen years ago. Brian works for Disney Merchandising to this day. He had many story's to tell me of how the Animation Building had been taken over by management after the executives closed the Florida studio. Apparently every square inch of space is now cut up into cubicles and the only hint that for over 10 years the building was at the forefront of a golden age of animation is an animators jacket which has been encased in glass and hung near the bathrooms. 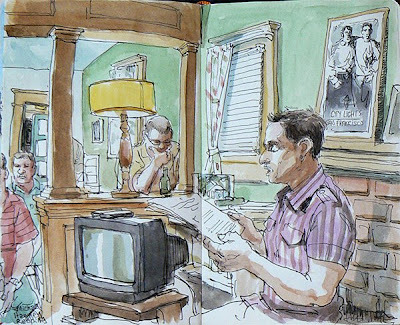 I returned to the Kerouac house with my wife for a farewell reading by resident artist Michael Hawley. Upon walking in, we were warmly welcomed by a lighthearted woman named Summer. She introduced us to Kim, the VP of the Kerouac Project and then Mike the artist in residence. The warm inviting atmosphere made me feel right at home. Walking from room to room the house caused me to remember my childhood home in Dumont, NJ. For instance the lime green and white linoleum tiles in the back room are identical to the tiles I remember from the basement in my childhood home. The large double porcelain sink in the kitchen caused similar flashbacks probably recalled from old photos of my my mother giving me my first baths in a similar sink. The reading itself was highly entertaining. Mike set a somewhat quirky dysfunctional family against the wonderful expanse of the Florida wilds. His descriptions of the sounds and assorted fauna were vivid and engaging. You could hear a pin drop in the room as the 20 to 30 people listened intently. Everyone laughed often and gasped in shock when the story took a violent and unexpected turn. I do not want to give away any of Michaels plot, suffice it to say if you spot Michael Hawleys work on your local bookstore shelf, you should pick it up, you will not regret it. 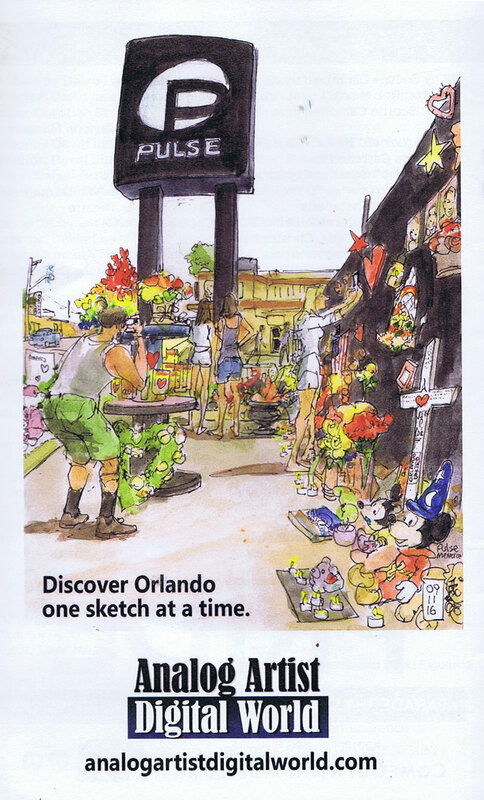 The evening left me feeling joy at having discovered an exciting intimate enclave of culture in the heart of Orlando. Everyone I talked to had an artistic spirit, Summer is herself a poet, Bob Kealing a local news anchor, has written a book on Kerouacs time in Florida and is working on other projects which unearth Central Floridas cultural history. All over Orlando these makeshift Valentines Uhaul trucks appeared. 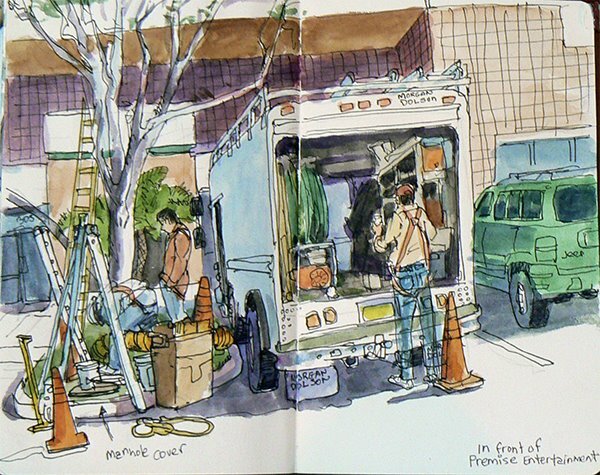 While I was doing this sketch a TV news crew came by and interviewed the couple sitting in the back of the truck. Every basket, box and bag was filled with roses, huge plush ducks, bears and other stuffed animals. 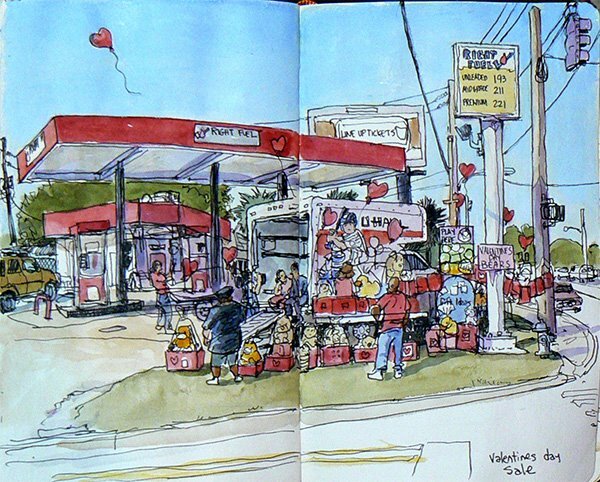 The red Mylar heart shaped balloons were the hottest selling items. I considered getting something, but I have a tradition of always get my wife a live orchid. I used to get my orchids from a lady that sold them out of the back of her SUV, but this year she was gone. I had to drive all over town searching for a shop that carried orchids. This roadside memorial is located just north of the First Baptist Church on John Young Parkway. 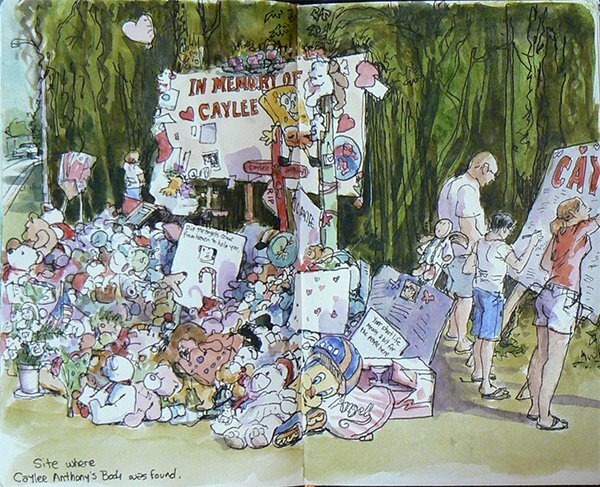 Since it is close to the where the Caylee Marie Anthony memorial service was held, I began the sketch believing it must have been set up for her. The Mylar balloons were deflated and roses were dead indicating that this memorial had been set up for some time. While I was working, a large Ford Explorer SUV roared up onto the grass median between me and the tree. 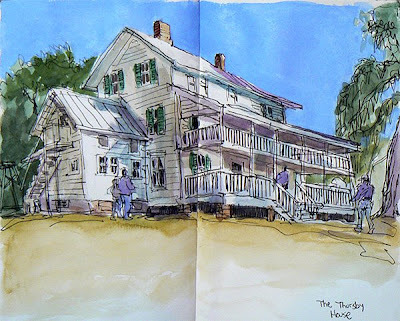 The African American woman inside was on her cell phone as she asked if I was sketching. I of course said yes and she related the information to whoever was on the phone. I asked her if she knew who the memorial was for and she shouted out a name which I could not hear over the sound of passing traffic. I had to ask two more times and finally approached her car door to catch the name. I would have asked here more questions but the tail end of her SUV was sticking out into the road and when I glanced over my shoulder I saw a line of cars backed up for a quarter mile. No one honked their horns, but she realized she had better get moving, and she drove off. The memorial is for James Marcus Johnson. I searched for information about him but could only find a short obituary that stated that he died on December 22, 2008 at the age of 22. On the day of Caylee's memorial service at the First Baptist Church, an alternate memorial was being organized by Leonard Padilla, a California bounty hunter, at the site where Caylee's remains were found. Padilla was banned from attending the service at the church by Cindy and George Anthony. Padilla had posted bond for Casey Anthony, Caylee's mother, but later revoked it saying that Casey was not cooperating the the search for her child. For some reason I felt ill at ease as I approached the site. This huge pile of toys, cards, flowers and signs decorated the area. The woods where Caylee's body was found were stripped bare and all the refuge was heaved into a compost pile about five feet high. Already a few palmettos were sprouting back up to reclaim the crime scene. 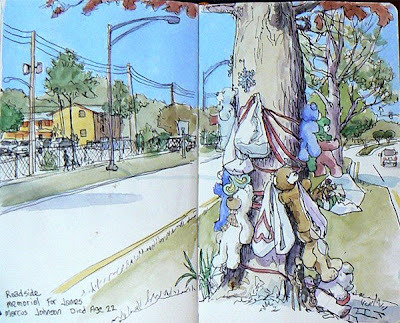 An elementary school is just a half block from where I was sketching. School let out and a large group of about 12 students were walking home on the opposite side of the street. They became curious as to what I was sketching and surrounded me and fired off a barrage of questions. Some of them went up to a board and wrote condolences and thoughts. One of the youngest pointed at my sketch and asked, "Is that Caylee?" Some of the kids wanted to pose for me in front of the toys, but I convinced them that they should get home to there moms. One couple who visited the site informed me that they had driven from Pennsylvania to pay there respects. Several times people getting out of there cars asked me if it was alright to take pictures. It is as if they thought it was my job to guard the site. As one man said, "A picture is worth a thousand words." This is a small taste of the media circus that set up camp outside the First Baptist Church for the Caylee Marie Anthony Memorial Service. The church set up a barricaded parking lot area specifically for all the media. 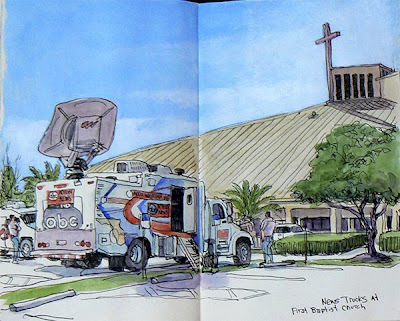 Reporters could use the church as a backdrop for the live reports but all the footage from inside the service was supplied by the churches 2 TV cameras with a live feed outside to the waiting trucks. I have read that an estimated 1,200 people attended the service, but it seemed to me like far fewer showed up, perhaps 2-3 hundred. The inside of the church is truely cavernous however so this might be a false impression. I attended the Caylee Marie Anthony Memorial Service this morning at The First Baptist Church. Honestly, I decided to go when I heard on the news last night that there would be no video recording, photography or even cell phones allowed into the service. To get in I had to put my sketchbook , pens and brushes in a bin at the metal detectors. The ushers were pleasant and helpful, making everyone feel welcome. Some families bought there small children to the service. The childrens voices could be heard a varying times adding a subtle tone of playful innocence to the proceedings. I was unprepared for how emotionally overwhelming the actual service was. It pointed to the Orlando communities strength in times of trouble. The feeling of love and compassion was palpable. Toward the end of the service the lights were dimmed and a video was shown called "Gone too Soon". It was a masterfully edited tribute to Caylee's short life. There is something sublime in the final shot as Caylee pulls back, and then is shrouded behind, a cloth window shade. It was also hard not to be moved by the tearful words from George and Cindy Anthony. Cindy Anthony said "Caylee Marie has taught many to love a child they have never met." "Let's stop the negativity and speculation." "Let's stand up for our right to live in a world filled with hope and faith and love". George said he wore a lavender shirt because it was Caylee's favorite color. He also stated, "Do not form any judgments, because I tell you, you don't want to be in any of our shoes. Casey deserves prayer, she deserves understanding, she deserves love." The Anthony's humble words were greeted by a thunderous standing ovation from a respectful crowd. I hope the service helps the Anthony family and the community heal. Terry invited Roger and Melissa over to play recorders on Sunday. Terry said her focus was off. My focus was off as well. The performers would change the size of the recorder they were playing for each new piece. Sometimes they would even change instruments in the middle of a piece of music. This was frustrating since I would draw the recorder and hands in one position then look up again to find the instrument bigger or smaller than how I drew it. It seems a bit Freudian that Roger is holding a small recorder while the women hold large recorders. 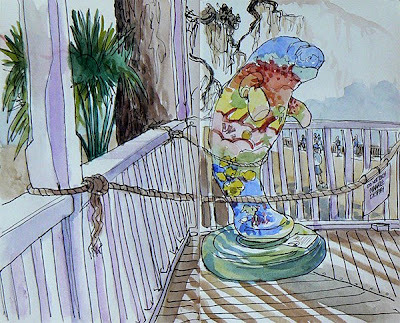 This Manatee sculpture stood on the porch of the Thursby house. It was roped off to keep tourists from touching it. The surface was covered with thousands of small mosaic tiles. People would press up against the ropes so they could get a picture taken next to the manatee. I overheard one lady telling her guests that as a child she used to swim with the manatees. She said the manatees would swim right up to you and roll over so you could scratch there tummy's. A few children started to harass the animals so park rangers had to stop letting people swim in the spring waters. Louis Thursby and his family were the first white settlers to make Blue Spring a permanent home in 1856. In the early years a steam boat was the only link to the outside world. This home was built in 1872. Originally the home was 2 stories with a cypress shingle roof. Louis's son John added the third story and the metal roof around 1900. There have been no major changes since. The first story is open to the public. It has been restored to the time period of 1872-1887 to recreate the family life during the steamboat days. The past 2 nights have seen temperatures drop below freezing. In Florida this is big news. It means citrus crops get frozen and many plants that are not cold tolerant will burn to the ground. It also means that manatees make the pilgrimage to Blue Springs to enjoy the springs constant water temperature of 72 degrees. I saw on the news several nights ago that over a hundred manatees are now in the springs. I figured the park would be empty on a weekday but oh, was I wrong. There was a half hour backup waiting to get into the park entrance. I almost turned around but decided to tough out the traffic. It was worth the wait. I do not know the official count but there were lots of manatees along with Gar, and Cat fish schools. I did this digital piece on location but when the sun made its way to the screen, I could not see what I was doing. I actually had to lean over to block the sun enough so I could see the screen. 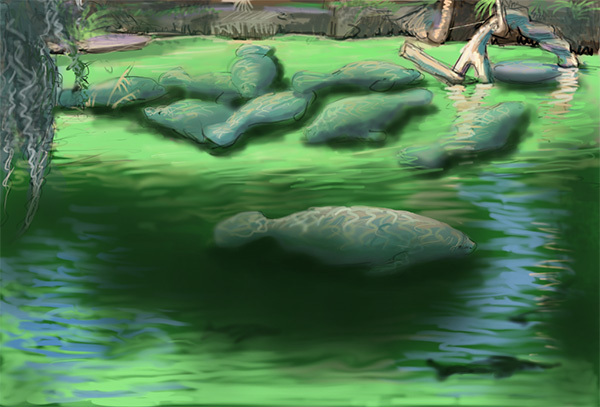 A large group of manatees were lounging on the far bank of the spring, and once in a while one would glide by heading up toward the source of the spring. Kathy was kind enough to let me spend some time next door to test my tablet doing some sketches from a model. A number of students walked up to me between poses to find out what I was drawing with. Even the model was curious about the tablet. He is now considering getting one for his brother in law who he says, "has to have the latest gadgets." I am finding the ability to add large flat tones behind the initial gestural sketch to be a real advantage. A brush size of 2.5 is about right for how I think the line should feel. I am slowly adjusting to this new way of working, but I still feel a bit retarded scratching away on a computer screen. I sat in the shade and tried to do a sketch with the tablet but it was to cold with the wind chill. 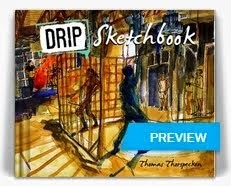 So I decided I would have to sit in the full sun with a traditional sketchbook in order to stay warm while sketching. This location on the lawn of a Methodist Church fit the bill. Across the street is a municipal parking lot and the Modern City Hall building. It is an absolutely crisp cloudless day. It felt good to be back at Full Sail after spending a few days wasting away on my living room couch. Kathy, the Course Director, showed the documentary called Frank and Ollie about two of the nine old men of Disney lore. It is inspiring to see how these two artists inspired and provoked each other to produce work that might not have been as good if they had not supported each other. 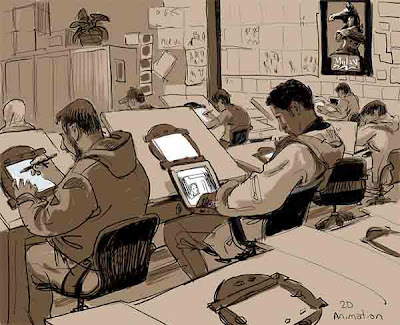 This sketch is a reminder that the animation disks have to compete with students laptops for attention. I am experimenting to see if I can come up with a way to get my digital sketches to read with a few sepia tones. My wife advised me to do in to the Doctors office after several days with a flu. The doctor squeezed me in to the schedule so I had to wait till the two other patients in the waiting room were taken care of. I had a fever of 104 the first night but what remains is just a nasty cold. The doctor just wanted to check my lungs to be sure there was no Pneumonia. I am fine. Last night I went to a meeting of the Orlando Reef Caretakers Association (ORCA). The meeting was held at a friends home and the place was packed. ORCA is a club for people who raise corals in reef tanks. I have had a reef tank for the past 5 or so years. I bought 6 coral frags to the meeting to be auctioned off. Last night they had over 270 frags to auction off. I got to the meeting at 6:30 pm and the auction was still going strong when I left at 12:30 am. 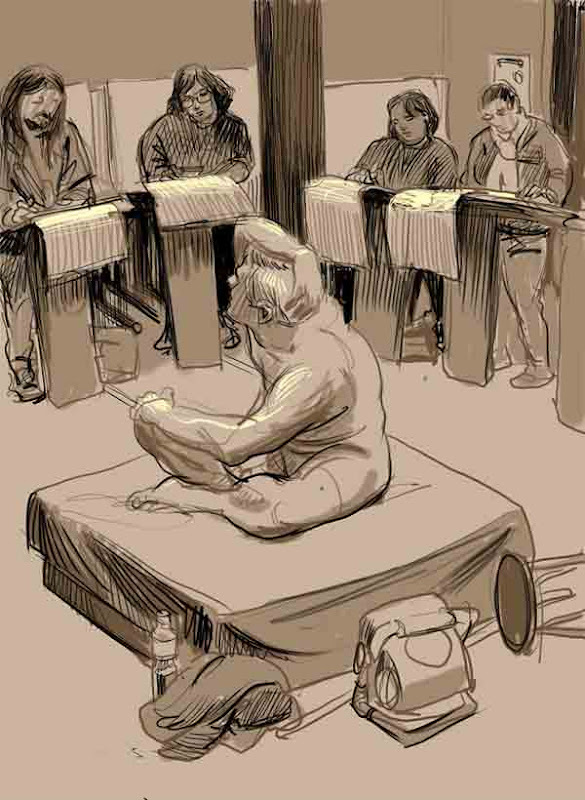 John is in the middle of the sketch holding up a plastic bag containing a frag. He is holding a microphone so everyone inside and outside the house can hear. Most folks are sitting outside in a screened in pool area and the rest are jammed into the living room and kitchen. A fake palm tree is in the corner of the room. Each purchase is logged into a laptop.